Down cushion products will cradle you in a cloud of comfort. Wrap a down envelope around a premium piece of foam to turn it into a plush self-fluffing cushion. Or, create a customized solid down cushion—your very own "cloud on your couch." Our down cushions and envelopes are covered with 100% cotton, 200+ thread count, down-proof ticking. Or, you may upgrade to our organic cotton ticking. The luxury of a down cushion—with polyester. We also offer a premium polyester cluster fiber filling, ideal for people allergic to down products. It is a premium way to make a down-like cushion, and is superior to a polyester batting wrap. Finally, for the craft-minded and cost-cutting crowd, we offer all the raw materials to build your own down cushions. Order either the 25/75 or 50/50 grade or better. This ratio reflects down/feather content. The higher down content the less feather leakage will occur. The white goose is more resilient and self-fluffing because it has a larger feather than duck down. This larger feather must be balanced by greater down content and consequently is much more expensive. The less expensive grades like 10/90 will leak more feathers and this is not something we warrant. Down is a small sphere-shaped feather from the underbelly of the birds. There are far more feathers on birds than down. Consequently, the higher the down content, the greater the cost. Down envelopes are advantageous and self-fluffing. When you get up off your cushion the foam inside causes the cushion to "stand up" again. 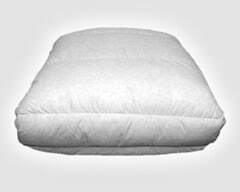 Control the firmness of your down cushion by choosing the desired foam. Keep in mind that back cushions must use softer foams. The foam is enclosed with a zippered cover, which allows you to switch foam easily under our foam exchange options. We default fill our down envelopes on the top, bottom and front where the back of your knees touch. These are the parts that can be seen. The sides and back don't have any fill and don't need any since you don't touch or see them. Please help us by specifying in the comments section in the shopping cart if you want other areas of your down envelope filled. For example, ottomans need fill in all sides and top only. These comments are very important as it removes any guesswork and ensures you receive precisely the down cushions you want. If you request filling on all sides be sure to also select the option to add 15% extra fill or the cushion may end up a little flat. Which foam should I fill my down envelope with? When selecting a foam consider your desired firmness and the dimensions. 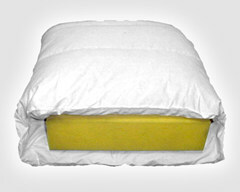 If your down cushions is 4" thick and you want it soft and cradling but not too soft choose EverFlex™ V24 foam. If you want it a little more supportive choose EverFlex™ V34 foam. (You can select foam options after specifying the dimensions of your down envelope and selecting the fill type.) Some people want to order our firm v44 foam or a harder foam but this is counter to the idea of using down and not recommended since it is so firm. Down envelopes will cause the overall cushion to finish approximately 3" thicker at its peak in the middle of the cushion and gradually taper down to the edges. This overstuffed look is called a crown. This crown is normal. A poly down envelope will finish 3"–5" thicker since the poly fibers have a greater loft. (Warning: Poly fibers flatten out sooner than the down does, and this is not warranted.) You can reduce the total cushion thickness by reducing the thickness of the foam inside. Don't reduce the thickness of the down envelope. Down envelopes need room to expand, so having foam that is 1" thinner than the actual down envelope works best. Down envelopes need to be ordered the same dimensions as the outer cover to fill out the outer cover properly (and always choose the option to "add allowances"). If you have a cover and are ordering a solid down cushion to fit inside of it, enter the cover's exact dimensions. We will add an allowance (oversize) to the down cushion to fill out your case completely. This allowance is recommended for all cushions except very small ones (with longest dimension less than 15 inches, or 38 cm). If you don't want these added allowances, you will be able to deselect this option. Either way, make your measurements and enter them exactly—it's best not to try to adjust or compensate when entering your dimensions. Let our system do it automatically for you. We strongly recommended that you select the 50/50 white goose. This grade offers the best combination of luxury and longevity. The 50/50 white goose grade will "fluff" itself back up better than any other down type and provide many years of comfort. Select the shapes of your custom cushions below. Then enter size measurements to see prices. Many contractors don't know this: The top of cushions should finish between 18" and 20" when measuring from the ground. Try measuring from the floor to the top of your couch cushions. Any taller than this and, psychologically, you will never want to use the custom cushions. Have the contractor build the top of your platform 14" from the ground. This will allow 4" cushions—a very comfortable thickness. Then the final product's total height will be between the ideal of 18–20". Many of the foams we offer to fill our down envelopes may be exchanged if you find you don't like the density you have chosen. See the details at checkout. Was a little hesitant to order our cushion on line. So glad we did. Love the quality! This company provides awesome products, well made, great choice of fabrics. Even the skate gray seems to be vibrant. Would absolutely order from you again!! Wow. We cannot believe our measurements were right on and the replacement sofa cushions are awesome. Like a new sofa now. Great product.